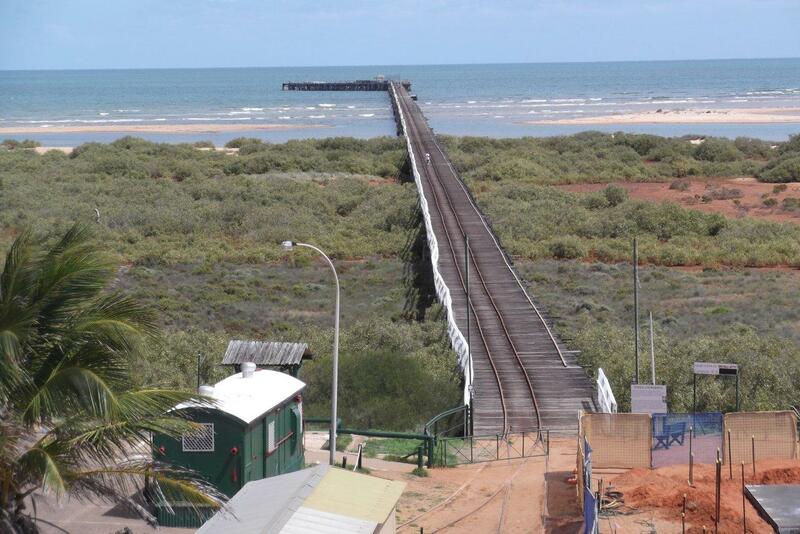 We arrived in Exmouth on Thursday the 12th April having driven from Warroora Station. We had heaps of washing to do (as we’d been in free/cheap camps for the previous 7 nights), so we got to the Exmouth Caravan park, got setup and started the loads of washing (once the power to the laundry was back on after an unexpected blackout!). 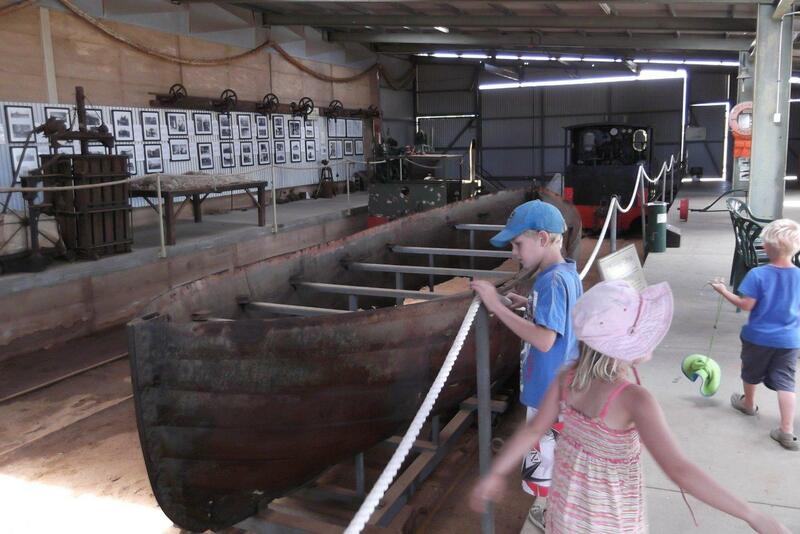 Once we’d got some of the washing underway, we went for a drive to the visitor centre to see what Exmouth has to offer. We picked up some maps and brochures which will be useful for our time on the Peninsula. After lunch, Mike wanted to pickup some things from the hardware, so we found the store. Opposite the hardware was the mechanic, and we wanted to get an oil change for Bruiser (our Landcruiser) and the mechanic was happy enough to do it on the spot for us which was perfect. While Bruiser got an oil change, we browsed the hardware and bought the bits that we needed. 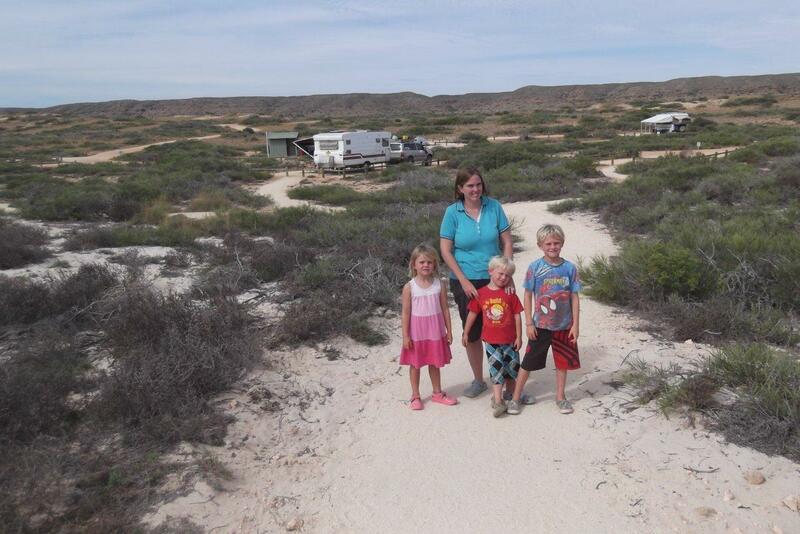 When the car was ready, we headed back to the caravan park for a swim to cool off in the hot afternoon. 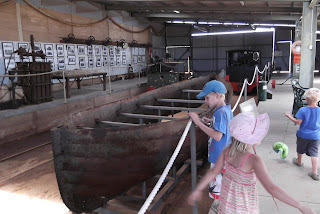 After we’d swum and had dinner, the kids and Liz went to watch a talent show that the caravan park was running (as it is school holidays). Mike skyped into his fortnightly Prayer Group (which he tries to do whenever we have Internet reception and it’s the right Thursday night). The kids really enjoyed watching the talent show and seeing other kids performing skits and showing off their talents. After the talent show, they were showing the movie ‘Kung Fu Panda’, so the kids watched the movie on the big screen they had setup outside. 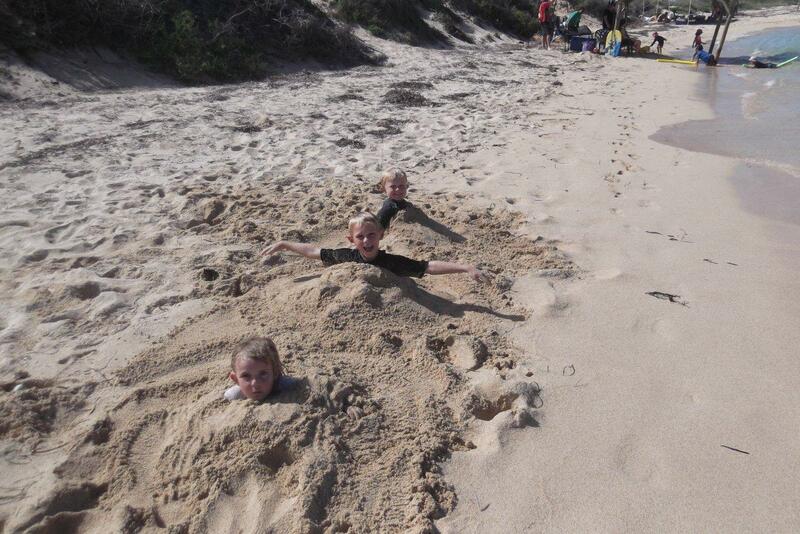 The kids had lots of fun, and didn’t get back to the van until about 9pm. The next morning we went out to see ‘shothole canyon’ and ‘Charles knife gorge’ which were only about 30km’s away from Exmouth. 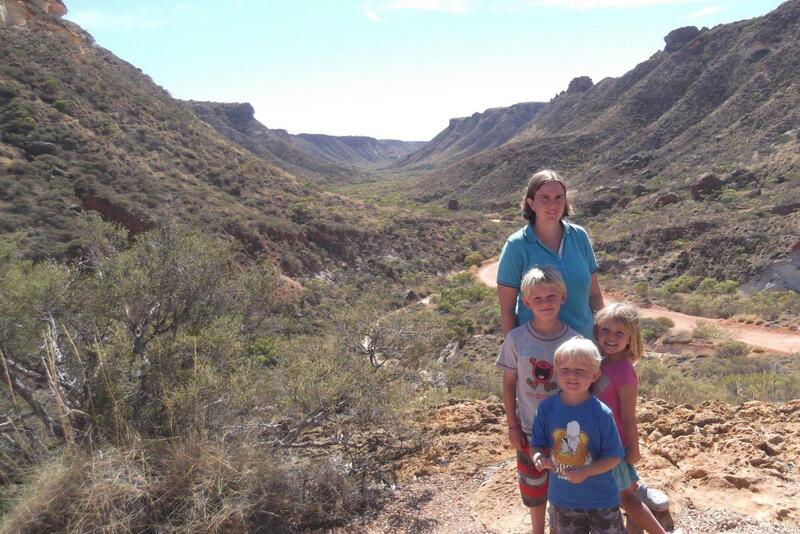 The Shothole canyon was very spectacular. We drove along the bottom of the canyon and looked up at the cliffs towering above us as we drove along. There was no water in the creek/river, but it was a really great place to have a look at. We then went along to the Charles Knife Gorge and this time we drove along the top of the clifflines and looked down on the gorge below. Again it was a really spectacular sight. 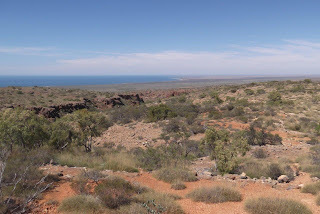 We drove out to a lookout which gave a great view over the Exmouth Gulf as well as a lot of the peninsula. 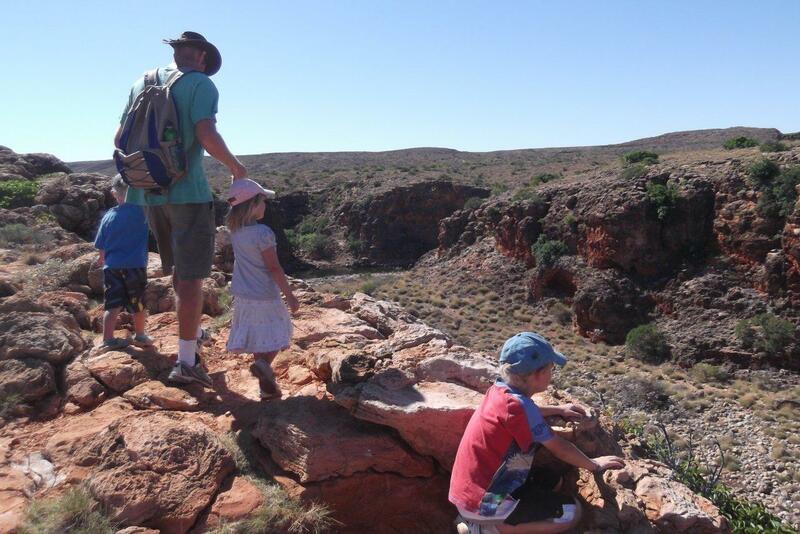 It was quite hot, but we all enjoyed looking at these great and rugged places. After lunch we did a very brief shop at the IGA and then headed for a swim in the pool at the caravan park. We decided to celebrate the fact that we have now had 6 months on the road with some take away pizza – which everyone enjoyed thoroughly. That evening there was another movie showing for the kids, the Bee Movie. Sam and Natalie were exhausted, but it was quite nice watching the movie under the brilliant stars in the warm April evening. Saturday morning, we packed up the car and the van. As we were packing up, the tailgate on the car broke which meant that we couldn’t open the boot of the car! Luckily we managed to use the broken door handle clip to get into the boot and once the door was open we rigged up a ‘pull string’ mechanism to open the boot with a piece of string, so we’ll probably have to use this to open the boot until we can get it fixed in Darwin. Anyway, we were out of the van park just after 10am and started the 75Km drive to our next campsite in the Cape Range National Park. 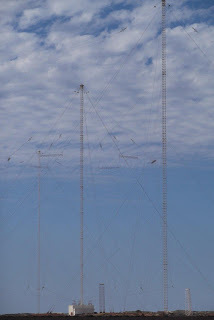 As we drove from Exmouth to the National Park, we passed some huge radio transmitters (which we later found out were radio transmitters used to communicate with Submarines around the globe). Anyway, we drove into the National Park and stopped at the visitor information centre to pickup a map and some info on the park. 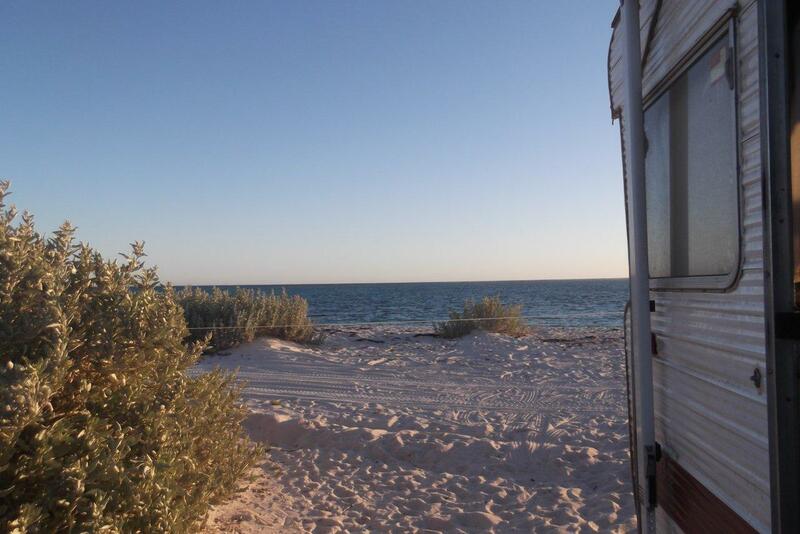 We had pre-booked our National Park Accommodation online, and we picked a campsite called "Kurrajong"; we made our way there and setup the van. 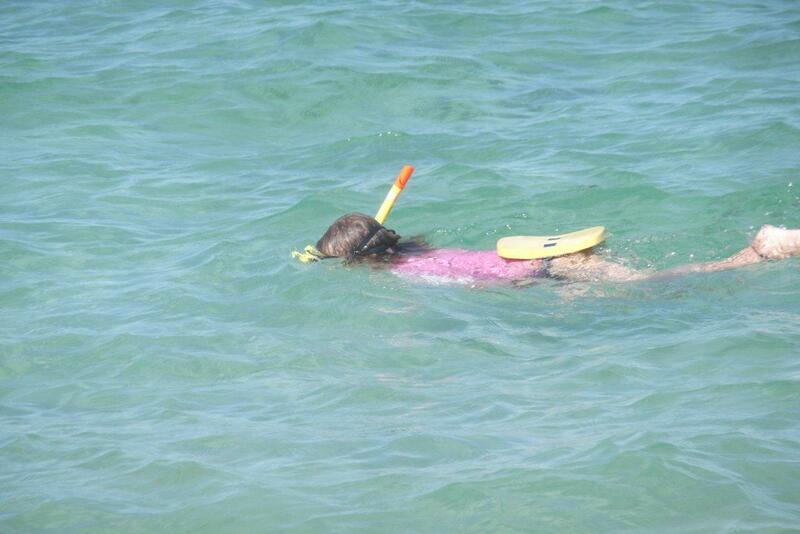 Once we were all setup, we decided to go for a snorkel at the beach just behind our campsite. 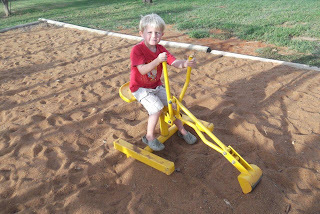 The kids rode bikes around the campsite with a new friend they had met (a 5 year old boy who was from Sydney as well and who’s family is travelling around Australia too). 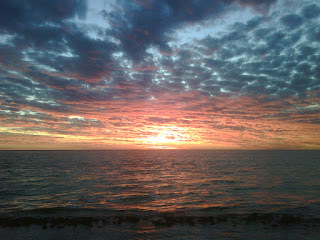 After we’d had dinner, we joined the camp hosts Dave and Judy on the beach to watch the sunset. It was a bit cloudy, so it wasn’t the best sunset we’d seen, but it was still very nice, and was an enjoyable evening chatting to some fellow Christians and watching the ever-changing ocean in front of us. On Sunday Morning we had organised to meet up with Lachlan and Bec Edwards (who are the ministers in the Anglican Community Church in Exmouth), so we had an early breakfast and were in the car by 8am to get to church by 9am. 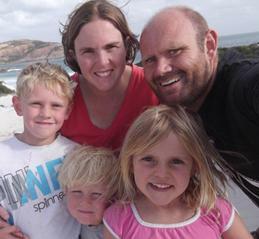 We really enjoyed going to church in Exmouth, and met some really lovely people. After church, Lachlan and Bec invited us back to lunch at their place, so we went back to their house and had lunch with them and their kids; Emily and Tim. They were sooo hospitable to us and we really appreciated their company and their local knowledge. Our kids loved playing with their kid’s toys and Emily and Tim were so great with our kids. Thanks Lachlan and Bec. It was quite late by the time we left Exmouth, but on the way back to our camp we stopped at the old Exmouth Base (which is now abandoned) but supported a few thousand people in it’s heyday, and we also stopped at Bundegi beach and the massive Submarine Radio to have a look. 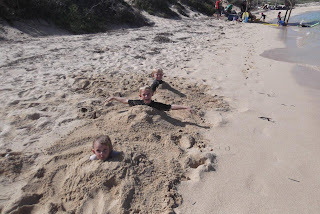 When we got back to the campsite, the kids did some more riding before we went down to the beach to join all the other campers at the Kurrajong Campsite to watch the sun go down over the ocean. 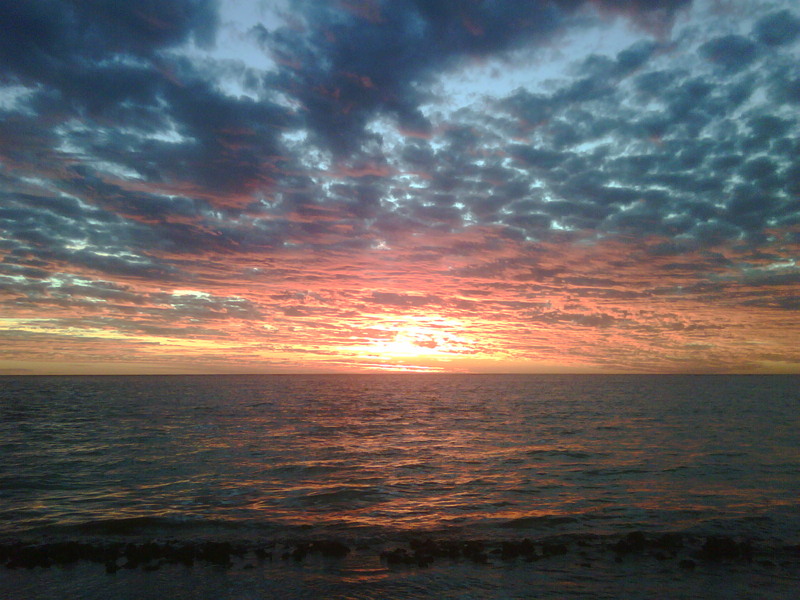 The sunset was absolutely beautiful and we had a good chat with Alex and Bel who are from Sydney and are travelling around Australia too. Once the sun was down it was time for dinner and then bed. 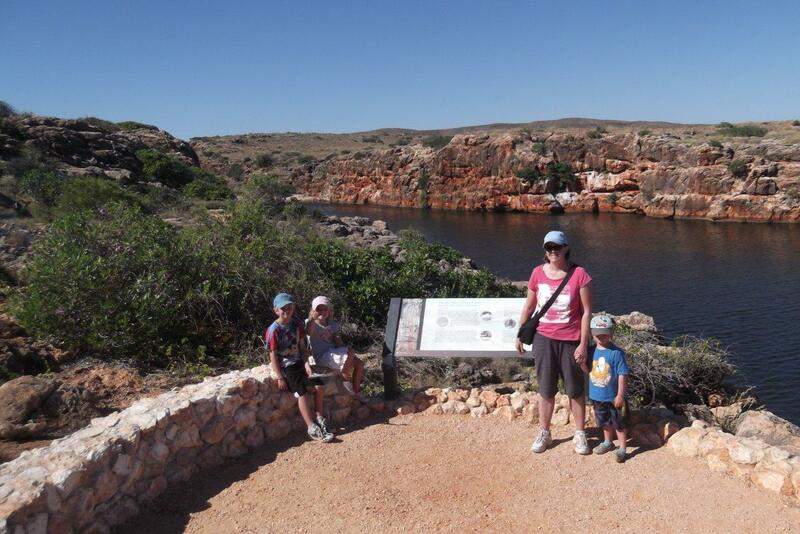 On Monday morning, we went to Yardie Creek (at the south end of the National Park). It was a perfectly cloudless day (like we've had so much lately) and by the time we got to Yardie creek it was warming up to well over 30 degrees. We went to the Gorge at Yardie Creek and did both the walks we could do. It was a lovely gorge and we had a good (but quite hot) walk. 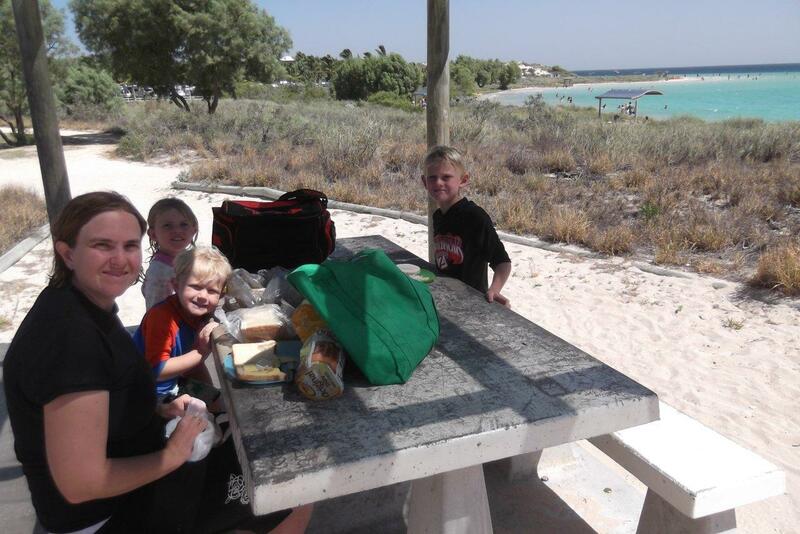 After we left the gorge we had a brief morning tea before heading to Turquoise Bay to snorkel at the Cape's most famous bay. It has 2 sides, a drift side and a bay side. We went to the drift side which has a current running over the coral and allows you to drift over all the marine life underneath (and hop out before the current takes you out to sea!). All the kids got to have a good snorkel along the drift loop. 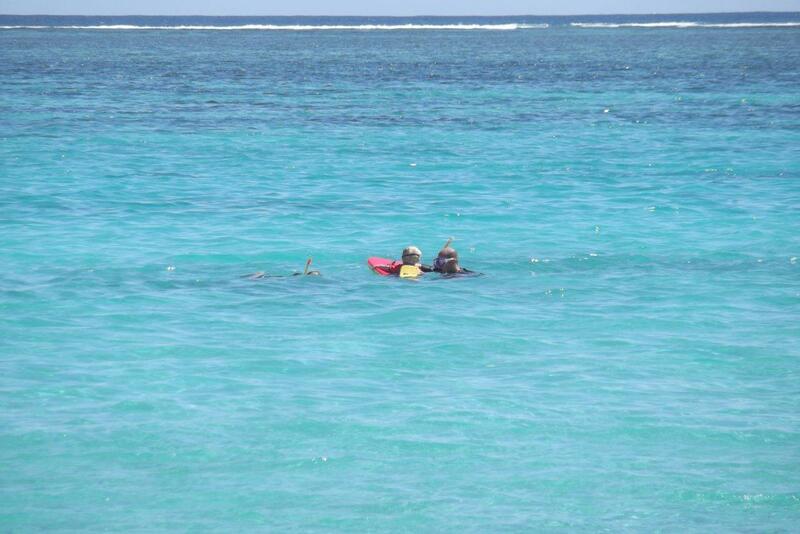 We saw heaps of fish, an octopus, lots of coral, a stingray and so much other life. 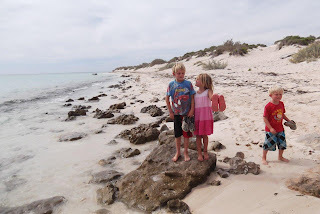 We stayed a few hours at Turquoise Bay and we all thoroughly enjoyed it. Once we’d eaten a late lunch, we had a rest-time (particularly for Sam, who was very, very tired (the heat really seems to make us all more tired than we were expecting we should be!)). 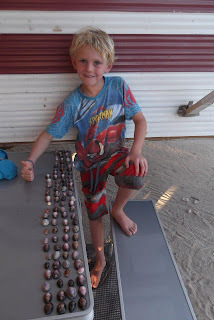 Sam slept for a few hours while the other 2 played games, read books or did beading. 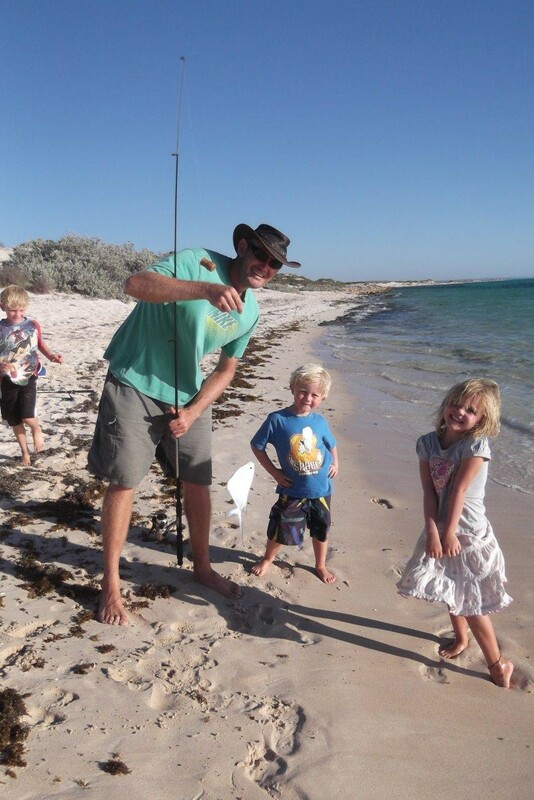 When Sam was awake again, we decided to go fishing at the beach behind our Caravan. We all went down as the kids really wanted to have a go. Mike setup all the kids with a rod or handline, and no longer than 30 seconds after the line hit the water, Sam had hooked up with a nice sized Silver Dart. There must be a lot of silver darts around, because Liz, Sam and Mike all caught one. Josh caught a big puffer fish (north western blowfish). We threw all our fish back, but we had heaps of fun casting out and having a small fight with a fish –it was quite a thrill for everyone. That evening we joined a large host of people (I think people from all 10 campsites were there) to watch an absolutely beautiful sunset over the Indian Ocean on Monday evening. We had a late dinner that night, but once dinner was done, the stars were well and truly out, so we sat outside in our camp chairs and stargazed for a while. Natalie spotted many satellites, and Mike and Liz pointed out some of the well known constellations. The kids really enjoyed the stargazing. By the time we had finished doing all the things we needed to do at Carnarvon on Tuesday the 10th April (after leaving Quobba Point quite early) it was nearly Lunchtime, so we jumped into the car and stopped at the first rest stop heading North out of Carnarvon to organise some sandwiches to eat in the car as we drove and listened to a Famous Five Audio Book. It was a very hot day (probably 38ish) and we had the air conditioning going full blast almost the whole day. We were heading for a cheap camp at Warroora Station (14 mile beach camp) and so we followed Navman's Green Line for just over 200Km’s. Along the way North, we passed a sign telling us that we were crossing the Tropic of Capricorn, so we stopped and got a photo! When we were looking for our campsite we drove for 5-6K’s on a very bumpy dirt road and then found a track heading to the coast. We weren’t quite sure what we were getting ourselves into, but when we popped over the hill and saw the water and the beach, we knew it would be a beautiful spot. 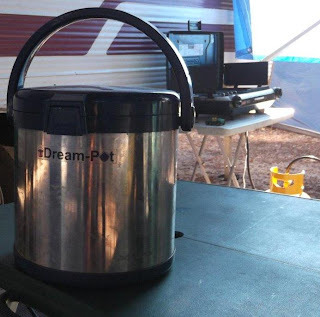 We setup camp, went for a swim and cooked some dinner. 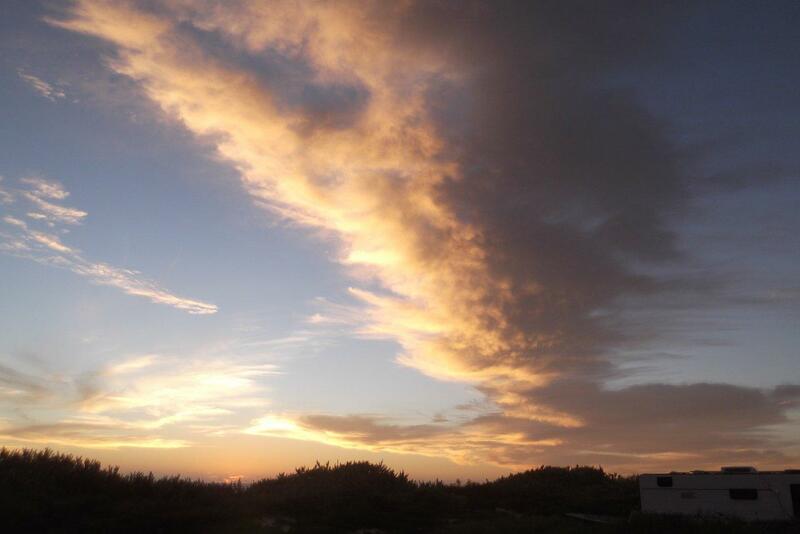 The evening breeze blowing through the van was fantastic and cooled us well on a hot night. We had a quick stargaze that evening because the moon hadn’t risen yet, and the stars were mindboggling. It was awesome. 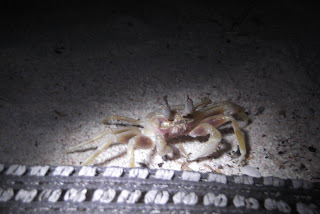 There were heaps of Ghost Crabs on the beach and they scavanged around the caravan during the night. We had to be careful we didn't step on any. 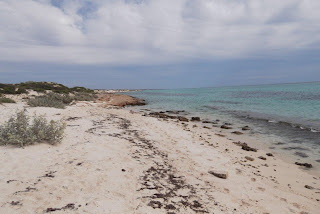 On Wednesday morning we drove 30Km’s into Coral Bay to have a look at the town and see if we could snorkel or go on a glass bottom boat. 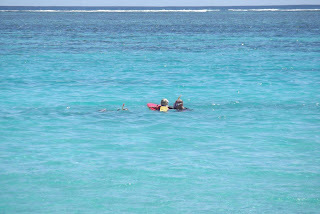 All the Glass bottom Boat tours had left for the day, so we donned the swimmers, had a look from the lookout and then had a snorkel on the inner reef (just off the beach). 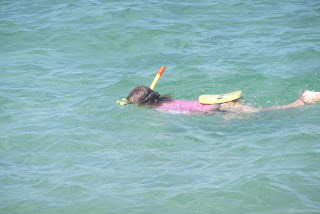 We found that the snorkelling was much better at Quobba Point (where we had stayed previously) because you didn’t have to dive deep down to see the coral and fish at Quobba, whereas in Coral Bay, there weren’t many fish and you had to dive quite deep to see anything (which none of the kids could do). 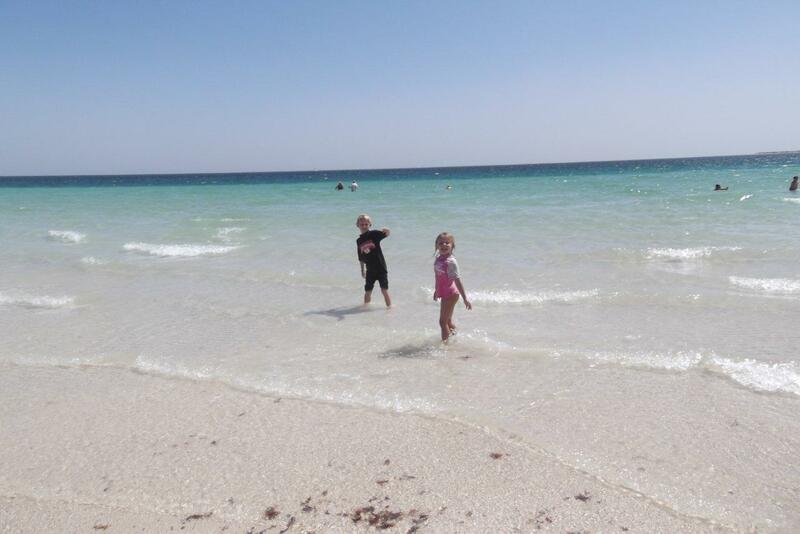 Nonetheless, we had a good hour or two swimming, digging holes in the sand and playing at the beach. We had a picnic lunch overlooking the bay before grabbing an icecream at IGA to cool us on the way back to the caravan– because it was another 38ish degree day, and quite steamy. We swam again at the beach when we were back at the caravan site and when we were getting dinner ready that afternoon a very brief shower of rain came down for about 5 minutes - that was the first rain we had seen in months! 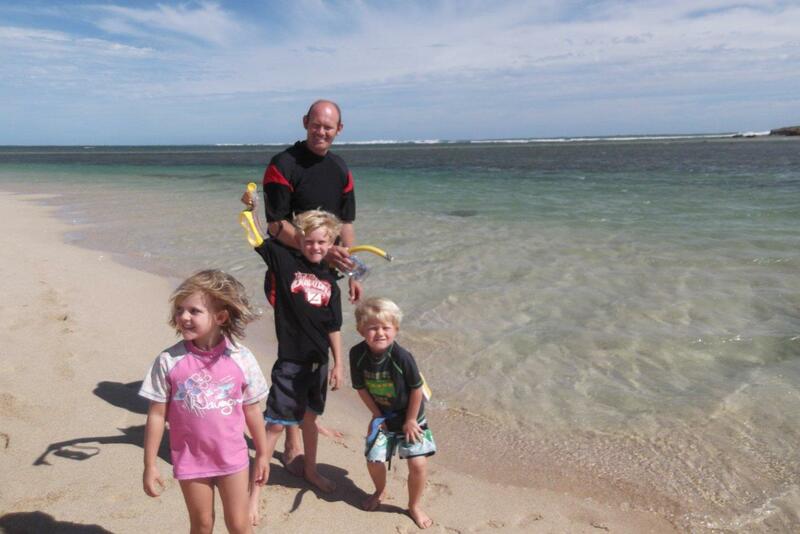 God has blessed us richly with the weather we have had on our trip over the last 6 months. Thursday Morning meant that it was time to Move north once again! 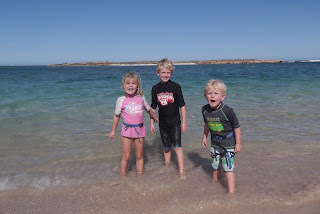 We had booked into a caravan Park in Exmouth while we were in Perth (we booked ahead because it was going to be school holiday time and we wanted to make sure that we had a place to stay). 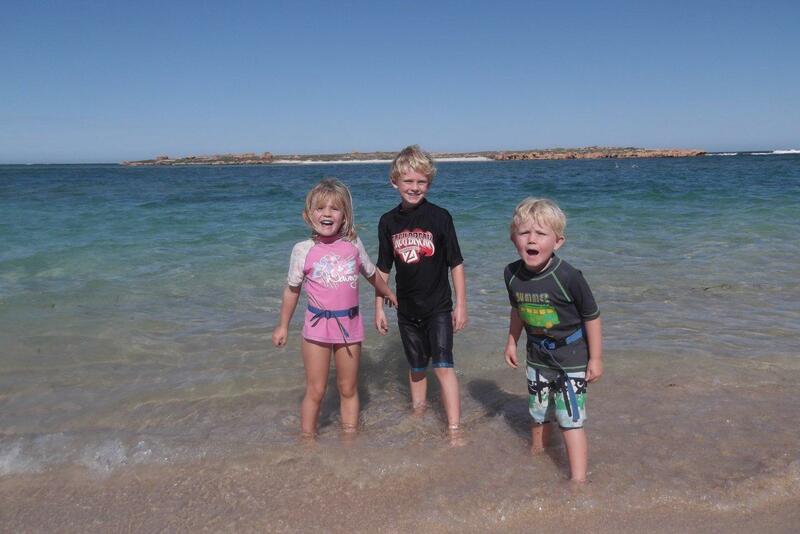 So on Thursday morning, we got up, packed up and drove a couple of hours North to Exmouth. 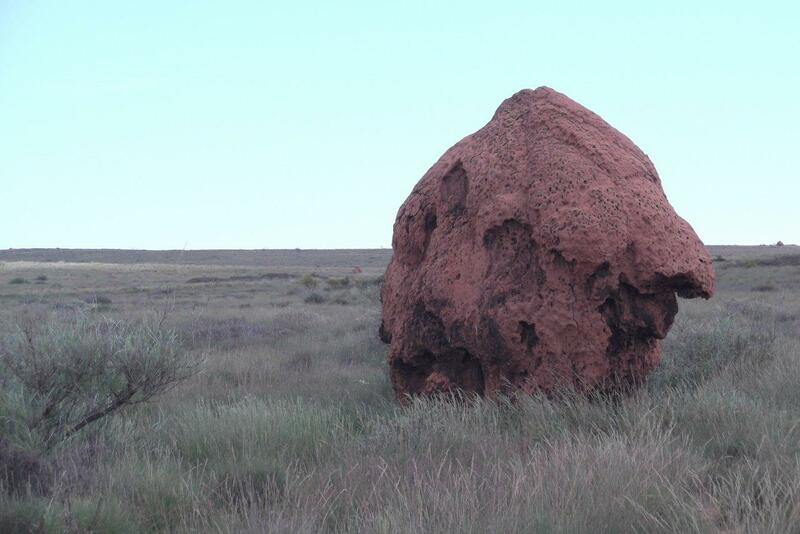 We passed lots of Termite mounds along the way North (which we hadn’t seen on our travels until that point). 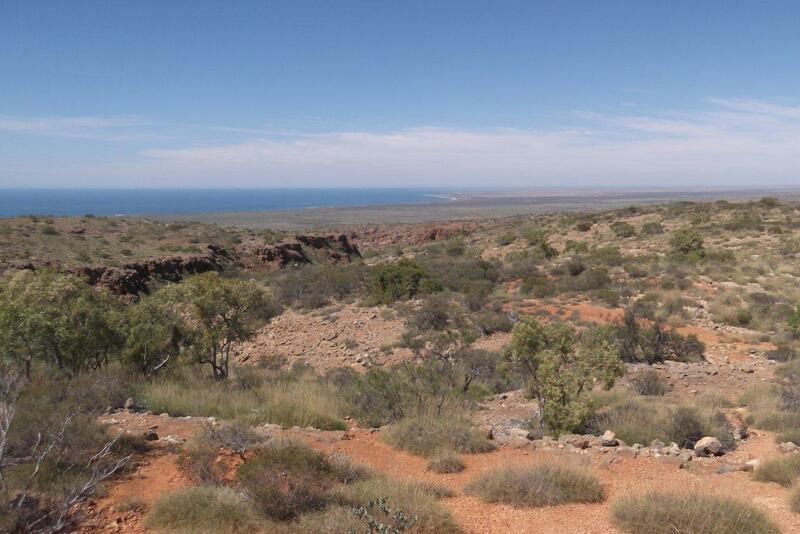 It was an interesting (and very arid) landscape along the way to Exmouth. 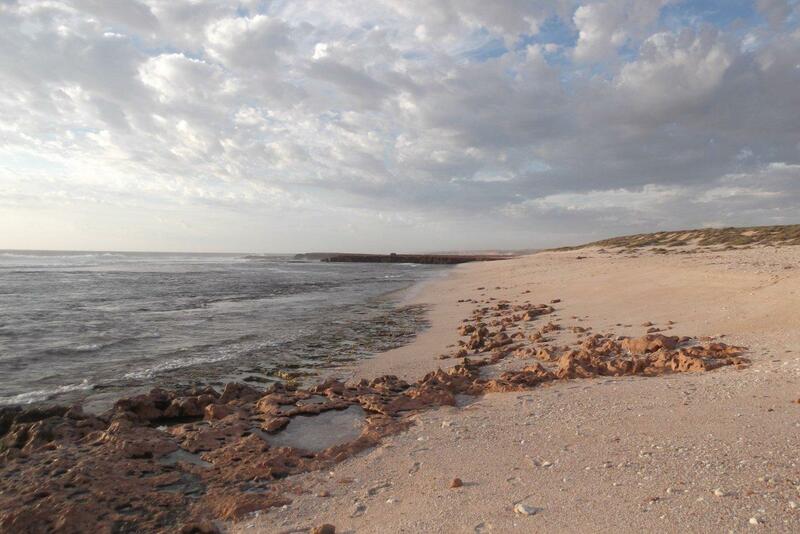 Point Quobba is only 75km north of Carnarvon. 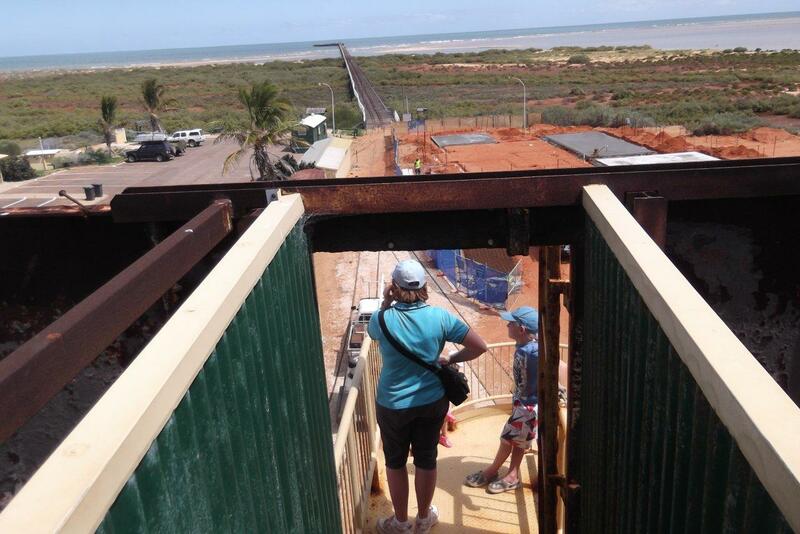 We decided that instead of going around to the turn off to Point Quobba on the main Hwy we would take a back road that would short cut the route. The nice back road soon turned into a dirt road and even though the signs had said that the road was open in a few places the road was completely underwater and we had to take a side track to get passed, which is a little stressful when you are towing a two tonne non-offroad caravan, but we made it through. 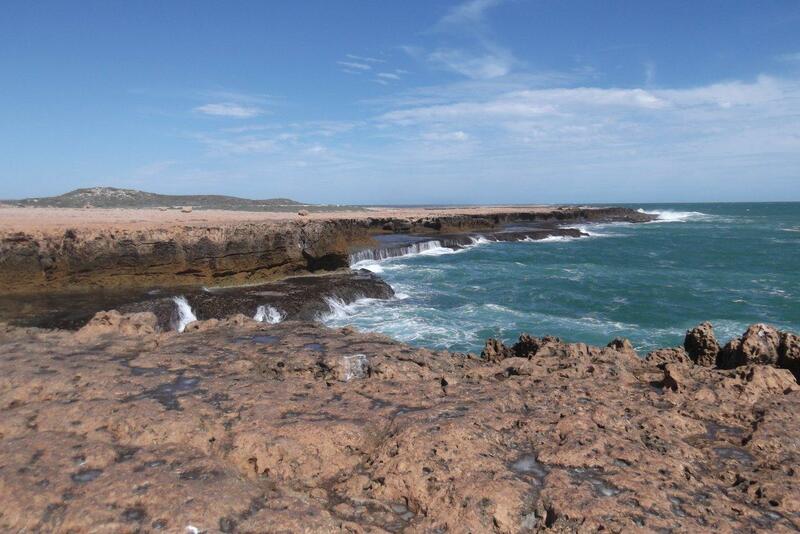 Once you get out to point Quobba you have to drive past the blow holes to get to the camping area, the waves were huge and therefore the blow hole was amazing. 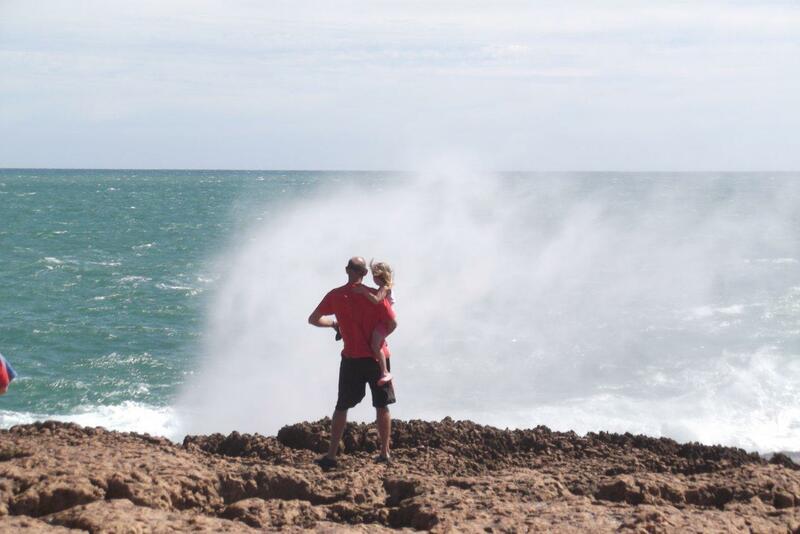 We decided to go and set up and come back later to check out the blow holes. 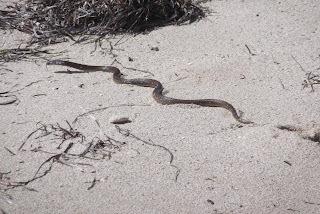 We had a bit of a drive around the campsite to find the right spot for us and had a Dugite (a type of deadly western brown snake) slither across the road in front of us. 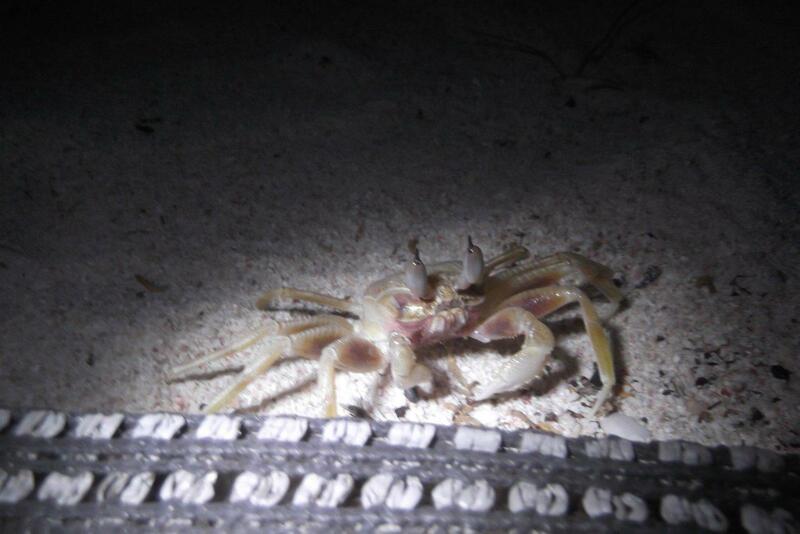 We watched it disappear through the bushes on the sand dune. 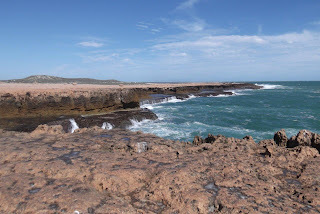 After picking our site we set up and then headed back to have a look at the blow holes and have a swim at blow holes beach, where there is a lagoon protected from the waves that is awesome for snorkelling, hundreds of beautiful fish and coral. That evening we enjoyed a nice walk through the campsite and watched another beautiful sunset over the water. The next day was Good Friday, the wind and waves had died down considerably so we were thankful that we had seen the blow hole the day before. We did some Sunday School that morning and spent a bit of time together remembering that Jesus died on the Cross for us. The kids did their own Sunday school craft (drawing) and we ate hot cross buns for breakfast. 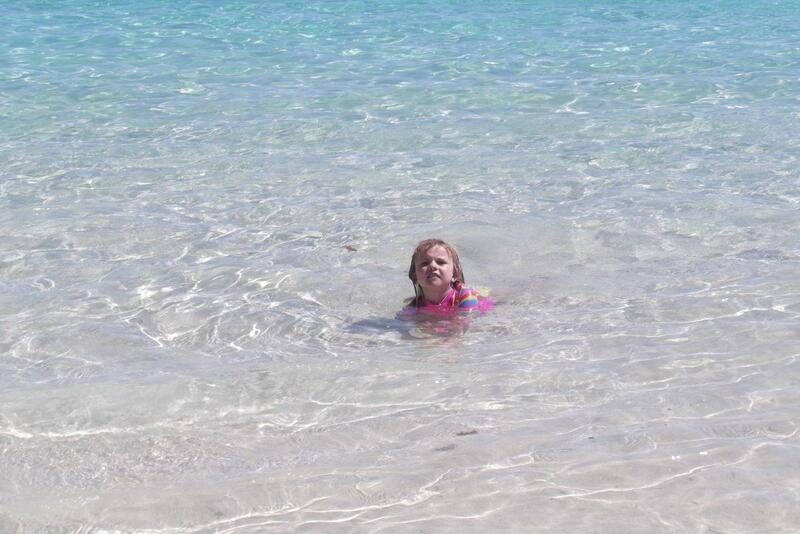 Later that morning we headed back to the lagoon for some more snorkelling, the water was beautiful and so refreshing. While we were swimming another Dugite (western brown snake) came down onto the beach, only about 10 meters from where we were, and went for a swim before heading back up the beach and disappearing into the bushes. We were a bit put off from swimming after this and headed back to the van for lunch. Our Neighbours at the camping area (Kevin, Trina and their dog Smokey) had told us about a beach that they call shell beach which is about 10km away near the Quobba station homestead, It has amazing shells, and they showed us some of their findings, lots of lovely big cowry shells. So that afternoon we headed out in search of shell beach and some shells. 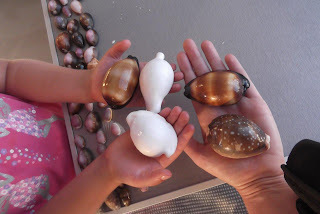 We spent about an hour and a half beach combing and we found lots of interesting things along the beach, some cowry shells but none the size of Trina’s. 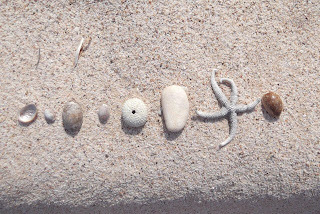 We worked out that we had gone a bit too far down the road and the beach we were on was not shell beach after all! Early on Saturday morning, the day started to heat up so we headed down to the Lagoon and enjoyed some more snorkelling (Josh and Natalie both now have the hang of snorkelling), we returned to the van at lunch time. 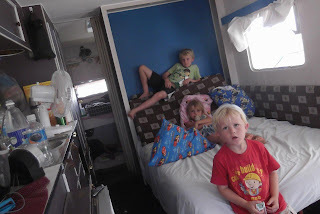 After lunch we set the kids up in the van to watch Finding Nemo and Mike and Liz got stuck into catching up on writing the blog. Easter Sunday the kids enjoyed hunting around the van for their Easter eggs, they were all very excited, and we all ate way too much chocolate. After breakfast we read about Jesus’ Resurrection from our children’s Bible and talked about why we have Easter eggs. 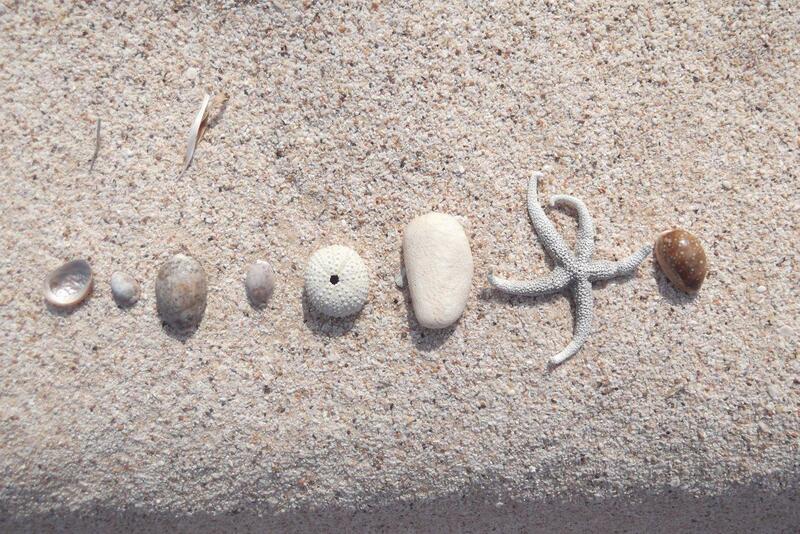 We did some more Easter Art to show Jesus risen again. Sam included a crab and a spider on his drawing :) It was time for some more snorkelling and swimming at the lagoon again returning to the van at lunch time. The kids then settled into another DVD. After this we ventured out to the lighthouse to have a good look over the area before heading back to Quobba station to find shell beach. 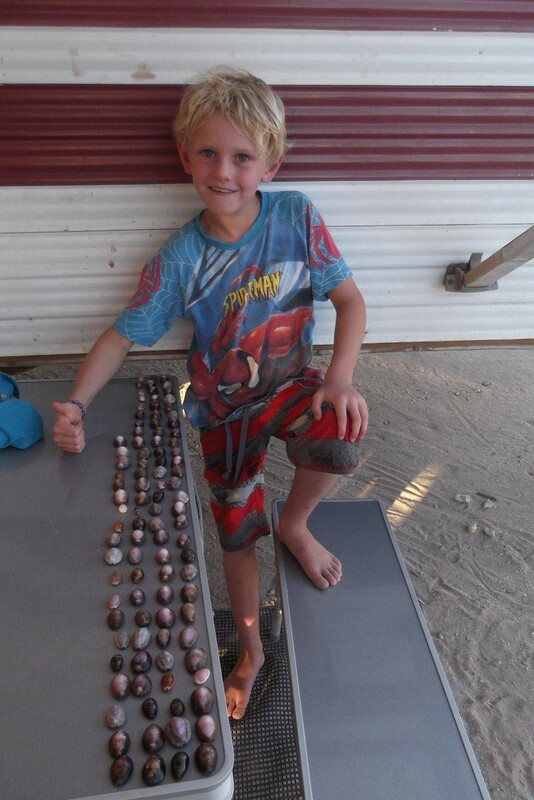 While Mike went fishing (with no luck), We found literally hundreds of cowry shells and a couple of really big ones. We took them back to the van and showed them to Trina and Kevin, who were very impressed with our findings. 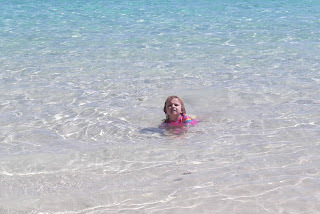 Monday we pretty well did the same as we have done each day while being at Point Quobba, we swam in the morning, watched a DVD after lunch, but because it was so hot that day we went for another swim in the afternoon before heading out beach combing again. 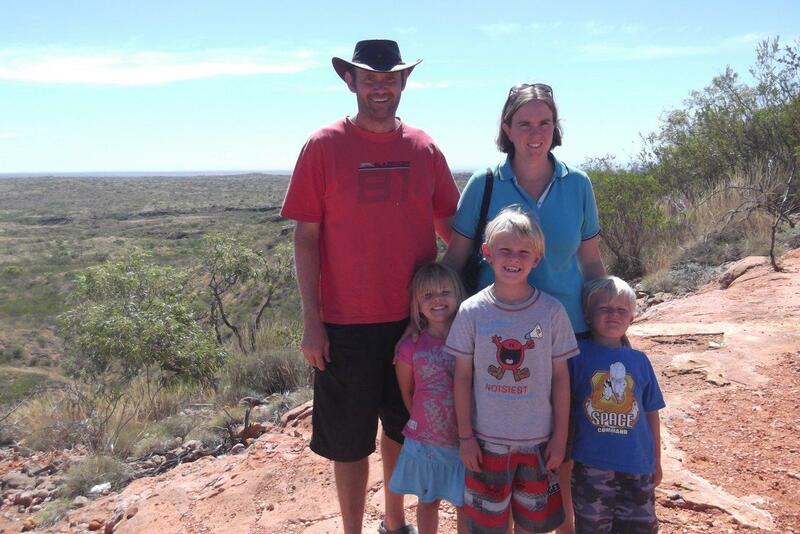 On Tuesday 10th April we packed up early, said bye to our friendly neighbours Kev & Trina (and their dog smokey) and headed back into Carnarvon to stock up our supplies (at the last Woolworths we’d see for quite a while). We also filled up with water and refilled our gas bottles. 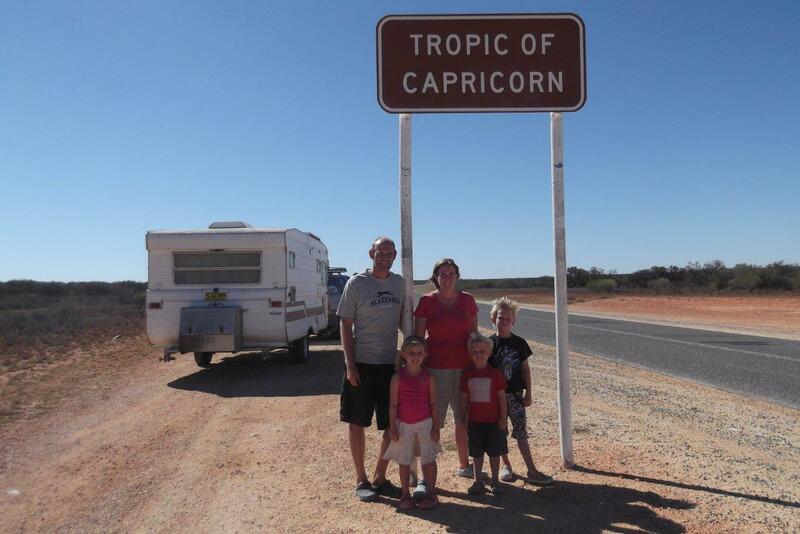 When we left Carnarvon, we continued heading north. We arrived in Carnarvon and checked into the Wintersun Caravan Park, we were planning to stay just two nights but they had an offer of pay two nights get the third night free so we decided to stay for three nights. That afternoon we headed into town and bought some food for dinner and then headed back to swim in the pool. The next morning we got stuck into getting school finished for the term, all we had left to do was an Art Unit. 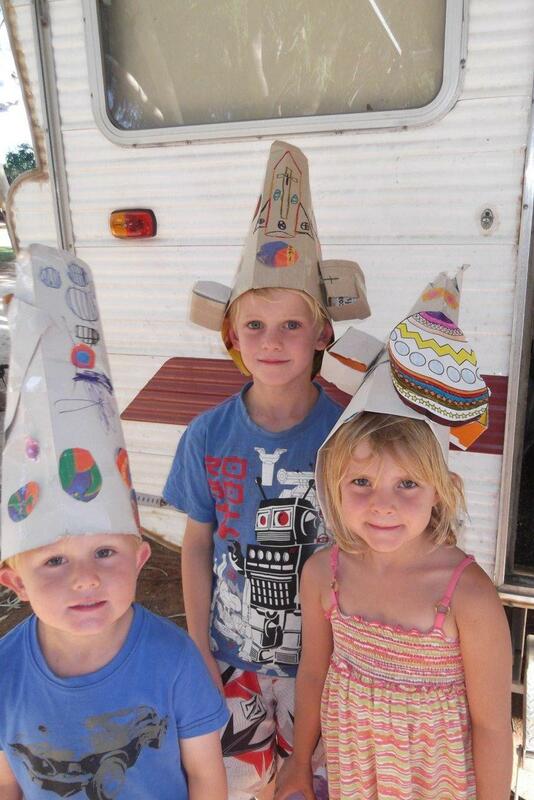 The kids had to make a hat and they decided to make an Easter Hat, so just using bits we could find around the caravan (eg. 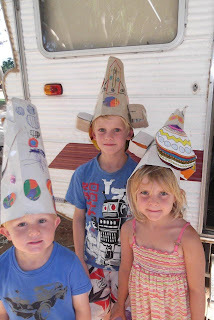 cereal boxes) we made three Easter hats and took photos of them to send to the teacher. even Sam made an easter hat for school! Once we had finished making hats, we headed into town to do a big food shop as Carnarvon has a Woolworths and we haven’t seen one since Geraldton and there is not another until Karratha, So it was time to stock up. 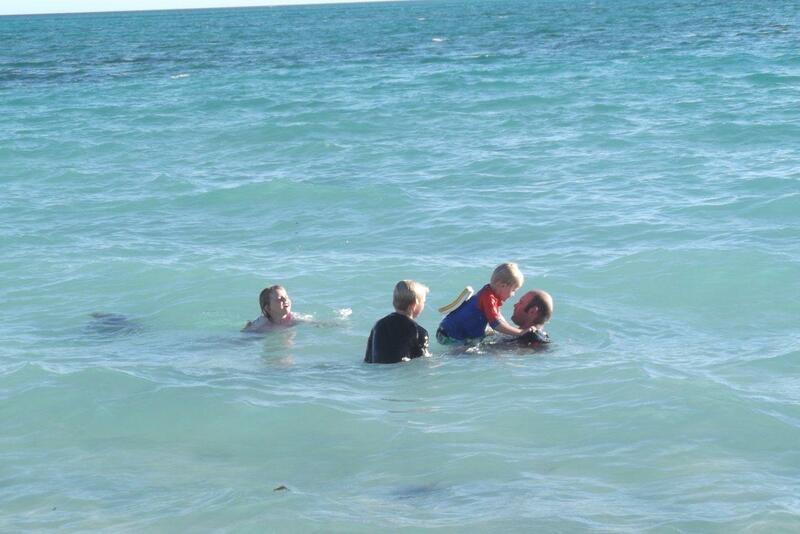 We then headed back to the van to have a swim. The next day we set off into town to have a look around. 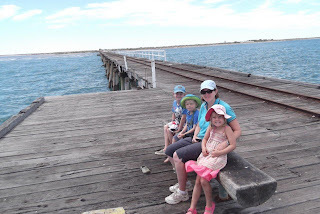 We found one mile jetty which has a train that runs along it, but of course the train doesn’t start running until Easter so we walked the one mile jetty. The jetty was not in as good a state as we thought it might be since a train runs along it, but it was a nice walk out and back and the kids did really well to walk the 3km return trip. From here we drove out to Pelican point for a look and then made our way back into town. 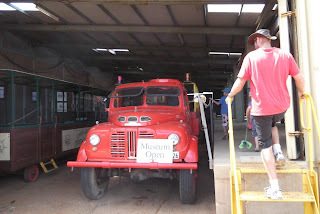 We then made our way to the Aboriginal Cultural centre for a look, and we admired the OTC Dish from a distance (as it is currently closed) and from here we headed out to “Bumbacks” Plantation to sample some real fruit ice creams. 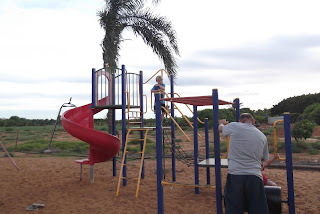 That afternoon we played in the playground at the caravan park.